Stephanie Senge engages globalization, consumption, and marketing in her art. She creates Ready-Made-Sculptures using the products of asian Mass production. Through her assemblance, she questions the quality of, the financial worth, as well as the importance that the individual suscribes to the utilized products. Senge ennobles objects that we usually give very little significance to, by presenting them in the thousand-year-old, japanese Ikebana, tradition. Her works are playful, but their playfulness does not deflect from their complexity. 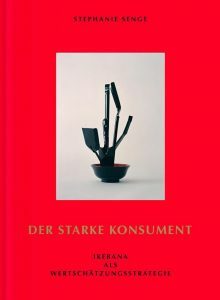 Senge who works in the european tradition of still life through the utilization of old japanese flower arrangements, seems to target the global, or globalized, language of the consumption aesthetic by taking possession of exactly that. She combines the contention between history and cultural identity, whose geographic boarders she opens, with the products of our throw-away society. Simultaneously, her pictures and sculptures radiate a calm and timelessness; qualities that come from the focus on the materiality of the composition and through the strict rules of Ikebana. In contrast to, for example, Pop-Art, Senge goes farther than just the reproduction of media images. Rather, with the help of a plethora of personality-emphasizing attributes, she portrays different aspects of our modern and global society. For her newest works, she has transcribed the Malewitsch Manifesto into a Consumption Manifesto and developed art works based upon those parameters. Stephanie Senge will fill the shrine „Konsum-Werte-Madonna“ with her collected selection of consumer products. These products all campaign with values such as freedom, love, power and solidarity.